There’s a reason we are called “infertility warriors”. We live each day with pieces of our heart broken and scarred. We live each day missing someone- a someone who might be able to complete our family- who we don’t even know yet. We live each day moving forward by going to work, to church, by being a wife, a mom, a sister and a friend- while always feeling a little extra weight on our hearts and mind. Being an infertility warrior simply means that you are choosing joy every day. And it’s not always easy. I am here to say that are ways to be happy through infertility. So is it possible to be happy and deal with infertility? In short, the answer is yes. But that doesn’t mean there won’t be days sprinkled with sadness, anger, depression, confusion or despair. And maybe it means that your happiness is what is sprinkled in between those days when you feel you just cannot go on. Whatever your happiness looks like- cling to it. Cling to those moments of happiness when you are able to laugh and breathe and truly feel at peace. Because if it’s fleeting- soak it up. Each day do something to gain happiness in your life. And it might start small but it is sure to grow the more you nourish and strengthen it. We all want the trials we go through to be validated. And sometimes it might seem that by truly being happy – you are saying what you’re going through isn’t important or hard anymore. But that really isn’t true. Again, it means you are a warrior because you do both. Let’s talk about some of the ways you can thrive, enjoy life and choose joy as you go through infertility. “While going through infertility, I struggled with severe depression. 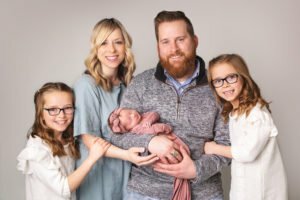 With all the infertility treatments, I felt like I was having major tunnel vision, where it seemed every moment of every day is so focused on that treatment and trying to become pregnant. Every month, every year was deeper blow to my heart and my mental state. I began to feel worthless. The way I was treated even by my own family and some friends, and I just felt completely worthless. I began to feel a need and desire to help someone else, anyone else, everyone else, who was hurting as much as I was, if not more. I have moments in my life when I’m miserable and going through infertility and then there are the moments in my life when I’m really happy– and still going through infertility. And you know what? I will take feeling happy any day over feeling sad. It’s a process and one that will have you taking a dozen steps forward and then ten steps back. But the important part is youkeep taking those steps to get back to where you were. I’ve accepted that my infertility won’t go away, my longing for a baby won’t go away- I have embraced this part of my life. Maybe you have, too. I know it’s there and the people closest to me know that my heart is always feeling a little bit broken on the inside, even if I’m smiling on the outside. I can cry when I need to. I can turn off social media when I need to. I can be bitter and sad when I need to, too. And that’s okay. As long as I keep moving forward and keep looking for ways to be happy, too. Because it is so much better that way. Your infertility, your heartache, your pain- it will always be a lingering thought in the back of your mind – but I challenge you to do what you can to find happiness every single day. Previous Post: « What Is A Chemical Pregnancy?